Here’s how to enable Secure Shell (SSH) service in Ubuntu 16.04 Xenial Xerus, the new LTS release, to allow secure remote login and other network communications. Ubuntu provides OpenSSH (OpenBSD Secure Shell) in its universe repositories, which is a suite of security-related network-level utilities based on the SSH protocol. For more, read the official manual page. Secure Shell (SSH) is a protocol for securely accessing remote machine, it allows you to run command line and graphical programs, transfer files, and even create secure virtual private networks over the Internet. Ubuntu does not provide the ssh service out-of-the-box. But you can easily enable it by installing the OpenSSH server package. After you changed the configurations, press Ctrl+X followed by typing y and hitting enter to save the file. When done, restart the SSH service. For more, read the community documents. This simple tutorial is going to show you how to enable Secure Shell (SSH) service in Ubuntu 14.04 Trusty Tahr. 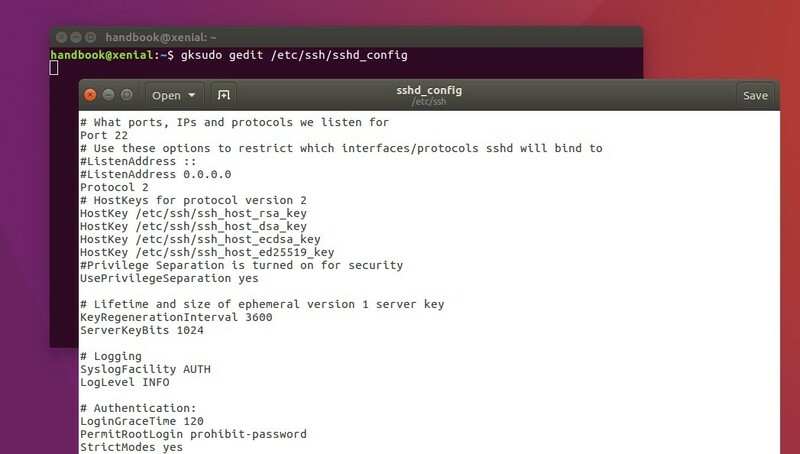 SSH is not enabled by default in Ubuntu, but you can easily enable this service via OpenSSH, a free version of the SSH connectivity tools developed by the OpenBSD Project. This simple tutorial shows you how to enable ssh in Ubuntu 13.10 Saucy Salamander. As you may know, SSH (Secure Shell) is a secure communication protocol that lets you remotely access networked computers. It is known as a replacement for Telnet which is very unsecure. While Telnet sends traffic in plain text, SSH on the other hand uses a secure protocol to communicate. That’s it. Use your client to connect to this machine via the default port 22. SSH service is not enabled by default in Ubuntu both Desktop and Server, but you can easily enable it just by one command. Works on Ubuntu 13.04, 12.04 LTS, 10.04 LTS and all other releases. It installs OpenSSH server, then automatically enable ssh remote access.